Hardcover, 9 in. x 10 1/2 in. included in any Early-Bird Special Offers. Knowing this will be his final update to Porsche: Excellence Was Expected, Ludvigsen has not been content to simply add on a few new chapters to the end of his magnum opus. Instead, he has gone back to the very beginning to revise the entire book, which now tops out at over a million words and 2,400 photos and illustrations! By his own account, "I knew some passages were not correct. More importantly, I wanted to leave Excellence in the best possible condition with all my later knowledge and that of others included and interpreted." To that end, Ludvigsen worked closely with the Porsche Archives as well as researching the many fresh interviews and recent memoirs that shed new light on the company and its products. 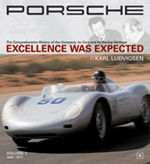 This new edition will cover the full scope of Porsche's existence as an independent, family-owned car company. Ludvigsen will also go behind the scenes to explore the events that eventually plunged Porsche into the hands of Volkswagen. 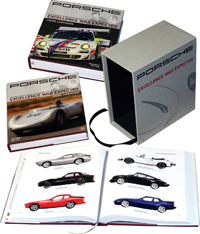 And he'll outline in detail just how and why, after the final schism from the Porsche/Piech dynasty in 2012, Porsche has continued to be Porsche. In this first revision since 2008, Ludvigsen has transformed his monumental work which now tops out at 130 chapters across 4 volumes. Taking full advantage of Bentley Publishers' plans to print the 2019 edition full-color throughout, he has added hundreds of new color photographs and diagrams spanning over a century of Porsche history. 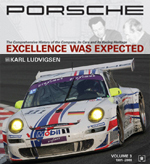 Ludvigsen's new material includes the continuing evolution of the iconic 911, allocating five chapters to dissecting the design and engineering of the Type 991 production cars and GT racers. He also looks at the continuing market success of the Cayenne, Cayman, Macan and Panamera. Competition coverage is expanded to include the exotic 918 hybrid and the winning 919 LMP1 racer. 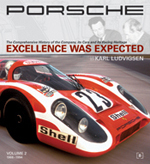 Porsche: Excellence Was Expected remains "the definitive archetypal marque history," (Michael Scarlett, Autocar) that it was in its first edition. Karl Ludvigsen continues to set the bar high for automotive historians, just as the company he chronicles continues to shape our very definition of the term "sports car." The successes of the rear-engined Auto Union (here in the 1935 Coppa Acerbo) brought worldwide fame to the still-new Porsche design organization. At the Watkins Glen Six Hours, 1970, a Carrera 6 (Bartling/ Peterman/Ranier) leads the third-place finisher, a Ferrari 512S (Andretti/Giunti). Victory went to two Porsche 917's. Porsche brazenly broke free of its sport-car niche with the launch of its Leipzig-built Cayenne in 2002. In this sport-utility developed in cooperation with Volkswagen, the emphasis was on "sport." At Sebring in January of 2008 the Penske team's RS Spyder strutted its stuff in the ALMS practice session, showing that despite a weight penalty it still had the credentials to lead the field.